When I saw this needle gauge necklace on Pinterest, I just knew I had to share it with all of you. 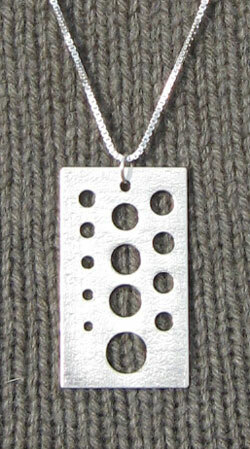 The necklace is sterling silver and embossed with textures to represent different stitch patterns. It’s pretty cool and modern looking. I wonder how many people would actually recognize what it was when you wore it? At $95 though, it is truly the gift for the knitter who has everything! 6 years ago by Kat in Knitting , Tools | You can follow any responses to this entry through the RSS feed. You can leave a response, or trackback from your own site. Imagination abounds in the crafters’ world…… Love it…!. Love the forum your blog gives to all we “CRAFTY” folk…..